DeltaMunki is a color comparison tool that calculates color difference values from X-Rite ColorMunki data. DeltaMunki lets you use your ColorMunki to make comparative measurements in production and manufacturing environments, rivaling spectrophotometer solutions costing thousands of dollars. Just drag any combination of individual color samples or projects from your ColorMunki software to the two color wells in DeltaMunki. DeltaMunki will immediately calculate the color difference between the colors, averaging multiple values within projects if present. You can also drag CXF files to DeltaMunki. This lets you use libraries of colors that you previously saved or that you have exchanged with another ColorMunki user. You can adjust the ΔE (pronounced "delta-E") threshold and DeltaMunki will colorize the readouts to make the values easy to comprehend. DeltaMunki also highlights the dimension with the largest delta, illustrating the largest difference between the two colors. Unlike many other measurement solutions, DeltaMunki averages color samples, making it possible to measure materials like woodgrains or textiles that have considerable variations in color. 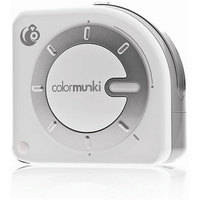 DeltaMunki works without a ColorMunki attached, so it does not require the ColorMunki software to be installed on the same machine. You can simply acquire spectral color data at one location, then send a CXF file to a second location to perform the color comparisons with DeltaMunki. Download below, then purchase from within the app for $49.95. Demo allows 50 color comparisons. Purchase a license to unlock full functionality. When you're ready to purchase, simply choose "License" from DeltaMunki's menu and click the "Purchase" button to checkout. After checkout, the app will auto-activate and you'll receive a receipt with your serial number which is good on up to five computers. Note: While DeltaMunki will function without a hardware device, it is only of use with spectral color information acquired with a spectrophotometer such as the X-Rite ColorMunki. DeltaMunki does not compare normal RGB or CMYK data. ColorMunki, ColorMunki Design and ColorMunki Photo are trademarks of X-Rite Incorporated. DeltaMunki is a trademark of bergdesign inc.